Born in 1974, Jitish Kallat is one of the best known and respected artists from India on the international scene. For over 20 years his wide-ranging and deeply reflective work has drawn an imaginary map connecting the everyday to the cosmic. Phase Transition is Jitish Kallat’s third solo exhibition in Paris and marks the artist's return to painting after close to a five-year hiatus from the medium. For the past five years, Kallat’s long-standing engagement with the ideas of time, transience, sustenance and the cosmological took the form of large elemental drawings, and investigative animation videos, photo-works and sculptures. Kallat’s newest works, titled Palindrome/ Anagram Paintings, draw upon insights from his varying artistic explorations, as well as his work from the mid-nineties, to produce a radical linguistic renewal accomodating a wide array of his recurring preoccupations. A hand-drawn graph undergirds the paintings as well as the Untitled (Emergence) Drawings a suite of small works on gesso panels. Like a ‘palindrome’, the large paintings can be read in multiple orientations, and are essentially ‘anagrammatic’ in that they reorder various components to create a sweeping web-work of associations. Abstract gestures seem to crystallize, acquire perceptible form and resonate with meaning as if celestial orbits, geographical coordinate systems, botanical and topographical evocations begin to reveal the signatures of generative growth, evolution and entropy. The seating within the gallery space has been altered by Kallat to assume the shape of the two hands of the Doomsday Clock, a conceptual clock that has been maintained and updated annually by members of the Bulletin of the Atomic Scientists’ Science and Security Board since 1947. It uses the analogy of the countdown to midnight – symbolising the apocalypse – to denounce the threats hanging over humanity. This symbolic seating, highlighting the ‘two minute to midnight’ setting of the clock as of 2018 serves as a platform for possible interactions offering a fresh perspective on the works. 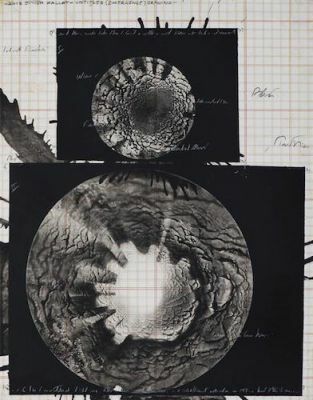 In the gallery basement, viewers can see where the roots of this new work lie, with drawings such as his series of Rain Studies, a meteorite-like sculpture covered with eyes of numerous species titled Covariance (Sacred Geometry), and the photographic work titled Sightings D7M6Y2017, where a fruit’s surface becomes a supernova, contemplating the macro as manifesting within the micro.